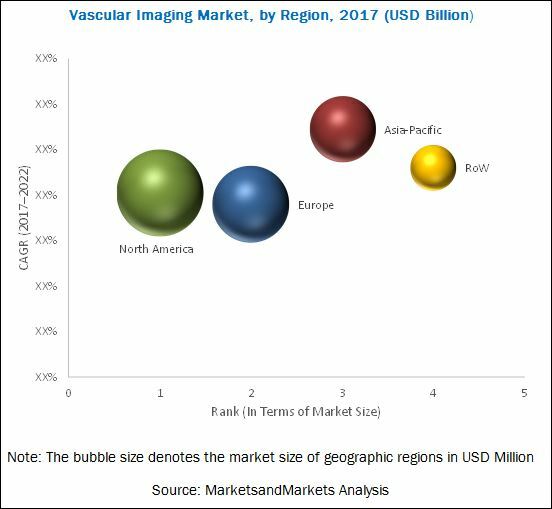 [143 Pages Report] The vascular imaging market is expected to reach USD 5.95 Billion by 2022 from USD 4.35 Billion in 2017, at a CAGR of 6.5%. Increasing prevalence of CVDs across the globe, increasing aging population, and technological advancements in vascular imaging systems are the factors driving the market. The key players in the vascular imaging market include Siemens Healthineers (Germany), GE Healthcare (U.K.), Toshiba Medical Systems Corporation (Japan), Hitachi Medical Corporation (Japan), Samsung Medison (South Korea), Shimadzu Corp. (Japan), St. Jude Medical, Inc. (U.S.), TERUMO Corporation (Japan), Koninklijke Philips N.V. (Netherlands), Fujifilm SonoSite (Japan), Hologic, Inc. (U.S.), Esaote SpA (Italy), Carestream Health, Inc. (U.S.), Konica Minolta (Japan), Alpinion Medical Systems (South Korea), Pie Medical Imaging (Netherlands), CorVascular Diagnostics LLC (U.S.), Evena Medical, Inc. (U.S.), LumedX Healthcare Technologies (U.S.), Xograph Healthcare (U.K.), Mindray Medical International Ltd. (China), Novadaq Technologies Inc. (Canada), Omega Medical Imaging LLC. (U.S.), BK Ultrasound (U.S.), and Piur imaging GmbH (Austria). This report aims to provide insights into the global vascular imaging market. It provides valuable information on the techniques, procedures, applications, end users, and regions in the market. Furthermore, the information for these segments, by region, is also presented in this report. Leading players in the market are profiled to study their product offerings and understand the strategies undertaken by them to be competitive in this market. The global vascular imaging market is expected to reach USD 5.95 Billion by 2022 from USD 4.35 Billion in 2017, at a CAGR of 6.5%. A number of factors, such as increasing prevalence of cardiovascular disease, growing geriatric population, preference towards non-invasive techniques for diagnosis and treatment of CVDs, and technological advancements are expected to drive the growth of this market. The market is segmented on the basis of technique, procedure, application, end user, and region. By technique, the market is segmented into MRI, CT, ultrasound, nuclear imaging, and X-ray imaging. The MRI segment is expected to lead the market in 2017. The rising incidence of CVDs and technical innovations are the key factors driving the growth of this segment. On the basis of procedure, the market is segmented into coronary angiography, peripheral angiography, cerebral angiography, microangiography, vascular ultrasound, and other procedures. The coronary angiography segment is expected to command the largest share of the market in 2017. Increasing prevalence of CVDs (resulting in increasing demand for non-invasive procedures) and rising geriatric population at a global level are factors that drive the growth of this segment. Based on application, the market has been segmented into diagnostic and therapeutic applications. Diagnostic applications accounts for the larger segment, whereas therapeutic application is expected to be the fastest growing segment. This growth can be attributed to the increasing demand for non-invasive procedures in diagnosis & treatment of CVDs and technological advancements in vascular imaging systems. On the basis of end user, the market is segmented into hospitals, diagnostics imaging centers, and other end users. The hospital segment is expected to register the highest growth in the market. Technological improvements and growing usage of imaging systems for diagnosis and treatment in hybrid operating rooms (especially in developed countries in North America and Europe) are major factors fueling the market growth in this segment. The market is dominated by North America, followed by Europe, Asia, and the Rest of the World (RoW). North America will continue to dominate the market in the forecast period. However, Asia is expected to witness the highest CAGR, with the growth in this market centered at China, Japan, and India. 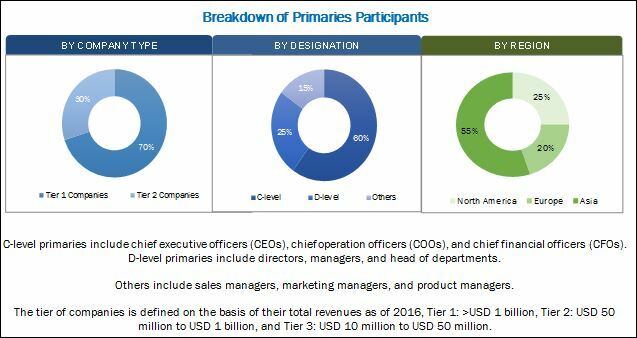 Increasing healthcare expenditure, increase in disposable incomes, and growing penetration of healthcare insurance are some factors propelling market growth in the Asian region. The availability of low-cost conventional alternatives for treatment is expected to restrain the market growth to a certain extent. Major industry players launched innovative products in the recent past and have plans to launch new products and expand across geographies by partnerships and acquisitions. GE Healthcare, Siemens Healthineers, and Toshiba Medical Systems Corporation are identified as the top players in this market. These companies have a broad product portfolio with comprehensive features. Further, these leaders have products for all end users in this segment, have a strong geographical presence, and more importantly focus on continuous product innovations.